Stapem Beluga, the first of two Incat Crowther designed 18-meter Aluminium Dive Support catamarans was recently launched in Port Elizabeth & landed safely in Angola. 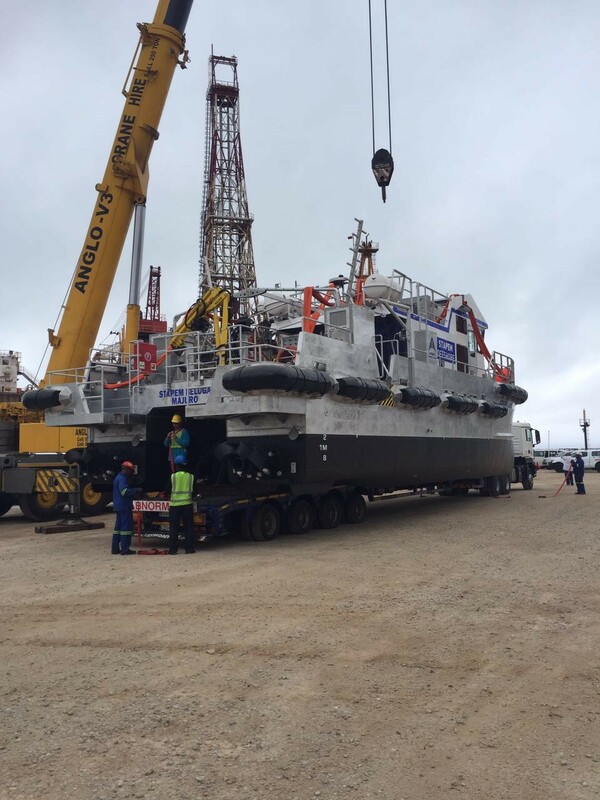 Built under ABS survey by the Legacy Marine Group in Port Elizabeth, South Africa for French oil and gas services company Stapem Offshore, this vessel will operate off the Angolan coast. The vessel design was fully customised to suit the client’s specific operational requirements and is equipped with a bow configuration specific to the landings on FPSO’s and Platforms for safe transfer of personnel. The vessel also has custom fitted NIBS fendering suited to the operational conditions. Equipment fitted to the vessel includes a 3-man Unique Hydra Nitrox air dive system, complete with multiple video and two-way communication as well as data logging systems, onboard HP and LP air compressors, underwater welding facilities, Caviblaster underwater HP washer, full diesel engine driven hydraulics system for subsea tools and deck crane, twin aircon units and FP duty and standby diesel generators. The vessel is also fitted with lighting to support night operations, including a FLIR camera system. The aft deck is configured to support diving operations and has full CCTV camera coverage. Dive ladders (4) and Davits (3) are also fitted to the aft deck. The vessel is classed to ABS +A1 (E) HSC Coastal Craft +AMS and has a full array of safety and detection systems suitable for use in the offshore oil & gas industry. Designed as a semi-planing catamaran hull, propelled by two MAN (560hp) inboard diesel engines coupled via ZF360 gearboxes to Hamilton HJ403 water jets with full MECS control giving it excellent manoeuvrability, an operational speed of 20 knots and a sprint speed of 23.5 knots. The efficiency, manaoevrability offered from water jet propulsion & the safety of having water jets on A dive vessel made Hamilton Jet the number one choice for boatbuilder & customer. The vessel is designed to work alongside a “mothership” and is not required to provide crew accommodations. It’s primary mission objective is to serve as an effective dive work station from which dive operations can be carried out on a 24/7 basis by a team of 14 personnel in a safe and comfortable manner.